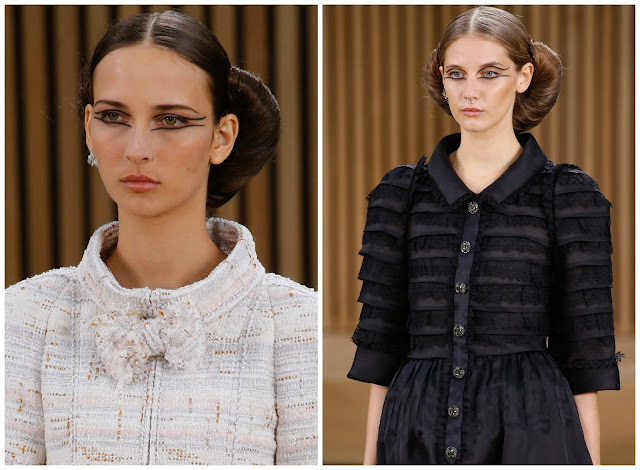 Karl Lagerfeld showed his Spring 2016 haute couture collection on Tuesday morning, at the Grand Palais. The German designer provided another set for the Instagrammic-age. A mechanic pavilion wood set, three stories high was placed against a blue sky backdrop. If you ever find yourself begging the question “where do the Chanel sets go following the show?”, I can provide you with the answer today. Vanessa Friedman reported that “all the wood will be recycled and composted after the show.” Kaiser Karl contributed to the sustainable fashion narrative that is one of the many issues currently facing the industry. 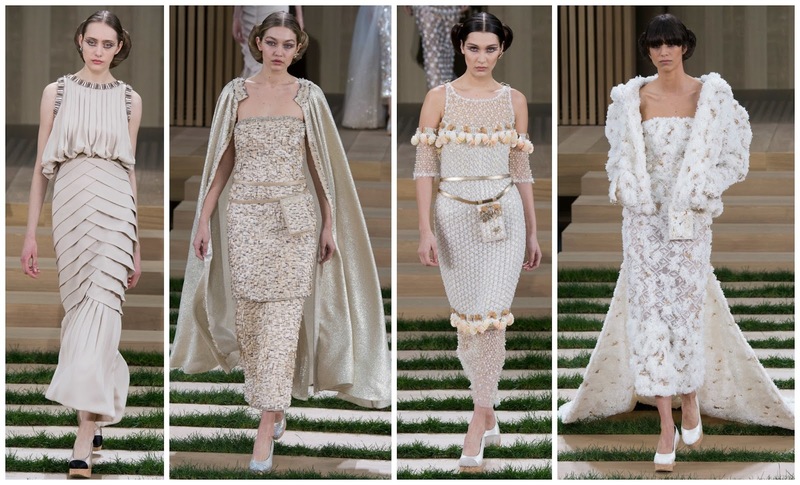 So eco-friendly inspirations aside, the couturier presented a delectable lineup of intricately detailed clothes for the über-rich to buy this year. 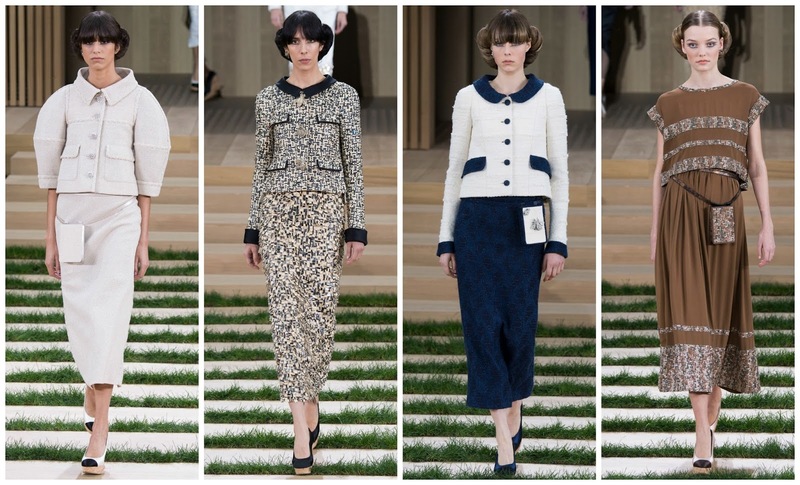 However, unlike other designers with sustainable, eco-friend ethos’, Karl said backstage, “this is high-fashion ecology. It must not look like some sloppy demonstration.” That’s what I like to hear. The usual suspects, tweed and boucle, were featured to their usual extent. Subtle modifications were, naturally, made to further entice existing customers into extending their Chanel haute couture wardrobes. Those who can afford Chanel couture already have a vast collection, I’m sure. 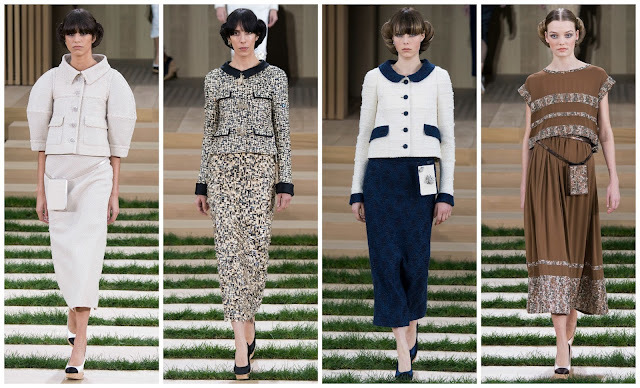 Edie Campbell’s white boucle jacket with navy accents was paired with a navy, embellished skirt. Jamie Bochert’s customer-friendly jacket in gold and black paillettes didn’t bear the impact of it’s skirt. A wood chip pailette skirt? Surprisingly, stunning. 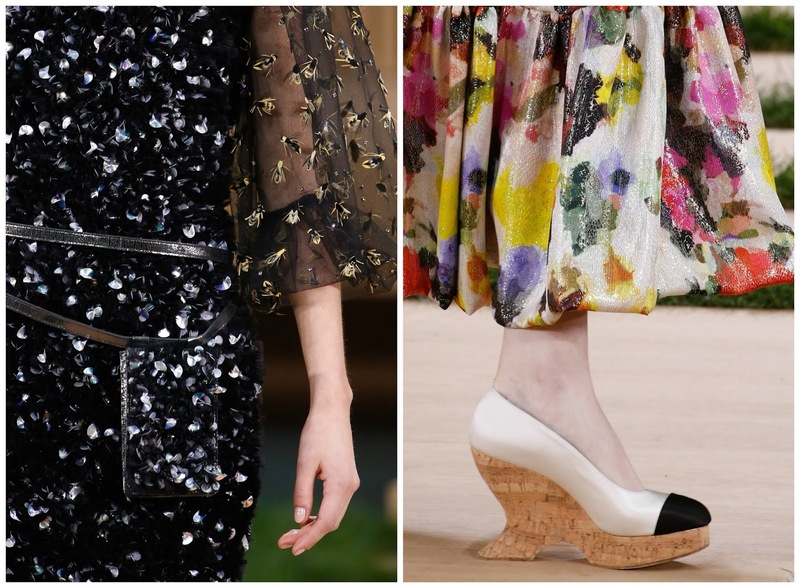 Bochert’s look wasn’t the only look that explored fine couture details. One dress, with balloon sleeves and a figure-hugging fishtail was richly detailed with floral embellishments. A bib dress was painstakingly-detailed with green flowers. Countless hours poured into creating these pieces paid off. They got their 10 minutes on the catwalk, but they are unforgettable. Hopefully this effect rubs off on the wealthy woman purchasing these pieces. One dress, full of character, featured shimmering butterflies, bees, leaves and other insects. An offering of evening dresses, larger than usual, made for an exciting excursion into Oscar-worthy territory. A soigné Kendall Jenner took to the runway in a black gown with subtle, pewter embellishment. This dress is calling Rooney Mara. More supple creatures emerged in gold-tinged garments. Charmingly beaded, the silk gowns in particular were a sight to behold. Gigi Hadid’s caped gown was lovely, as was her sister, Bella’s; amply beaded, shoulder bearing. Face of the Spring 2016 campaign, Argentinian model Mica Arganaraz was the Chanel bride. Her textured, clotted lace, midi-length dress was styled with a hooded jacket, no less. Two seasons in a row and Karl’s affinity for a flashy, Instagram-like-fishing sets has not outshone his creative output. 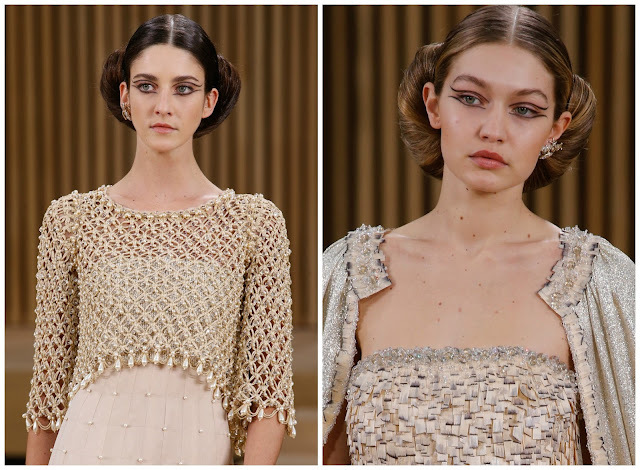 This couture collection may feature a lot of components present in every collection. There was innovation present in this collection. See woven skirts, wood chips embroidered into pieces, etc. The sublime evening gowns, and dearth of overstyled, overcooked looks also contributed to the collection being one of the stronger display in recent years. Exquisite sophistication is prevailing at Chanel in the past two collections - exquisite being the operative word.